Hawaii’s “Coolest Business Card” 1st place winner. 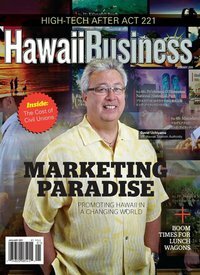 January 2011 issue. Awarded 2005 “14th Annual Keep it Hawaii” Certificate of Merit award by the Hawaii Tourism Authority for work on Papa Ola Lokahi’s website. A non-profit organization funded by the National Library of Medicine.